Aiming at a customized service, the Honco team guides you through all of the steps of a construction project process, starting by identifying the needs until the final completion of the work. Counting on a network of partners going from the Province of Quebec to the Maritimes and Ontario, up to overseas, we are capable of offering you a turn-key construction project while respecting you deadlines and budget. Our consulting experts have a solid experience to guide you during the planning process of your construction project, either for a new building or for an expansion. Analysing your requirements, we elaborate a building concept that fulfills your expectations and optimizes operational areas. 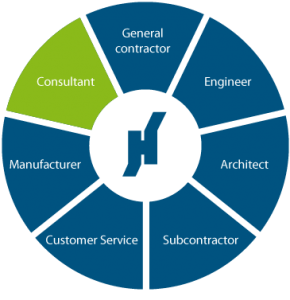 Assisted by software specially developed for Honco, our team of estimators can evaluate all the costs of your new construction or expansion project. Either for the building envelope or for a turnkey project, our estimators boast deep knowledge of the various components included in a building and of the market prices. They have the expertise to supply a precise cost estimate for the whole construction and to propose materials that meet high quality standards. Our estimators have the expertise and knowledge to meet the clients’ demands.